This is my second photo from the Crypt Gallery in Seaford, Sussex, in just a few days. On Saturday I blogged about an exhibition called Shoreline. Yesterday I returned to see a new art installation called Re:remembering - An Offering to Mnemosyne. It is by Athena Jane Churchill and relates to the Greek Goddess of memory who gave birth to the muses. The photo at the top shows just one of the works on display - a series of icons depicting faces and images of the Goddess. Other pieces in the exhibition are created from found objects, cabinets of curiosities, statues, jewel-encrusted effigies and an old and worn model of a toy sailing ship. Each has a story that goes with it relating to art, memory, past lives and finds from shrines and temples from our ancient pagan past. 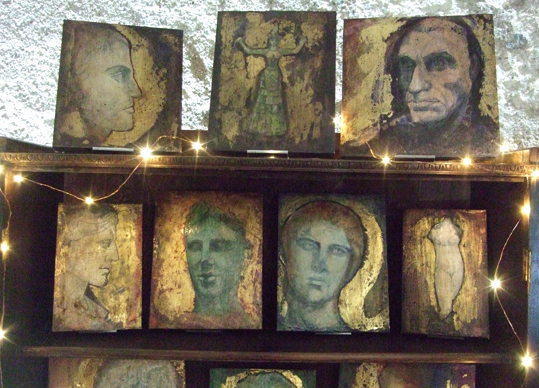 The gallery itself is wonderfully atmospheric, being in the crypt of an old church. It is perfect setting for Athena's beautiful works of art.